With so many competing demands for our time and energy, there’s little left over for us. We come last. Our needs are side-lined, our wants are ignored: we’re too busy to look after ourselves. But when our wellbeing becomes an afterthought, it impacts on our health. We feel frazzled, wrung out, and disconnected. And eventually, we crash. 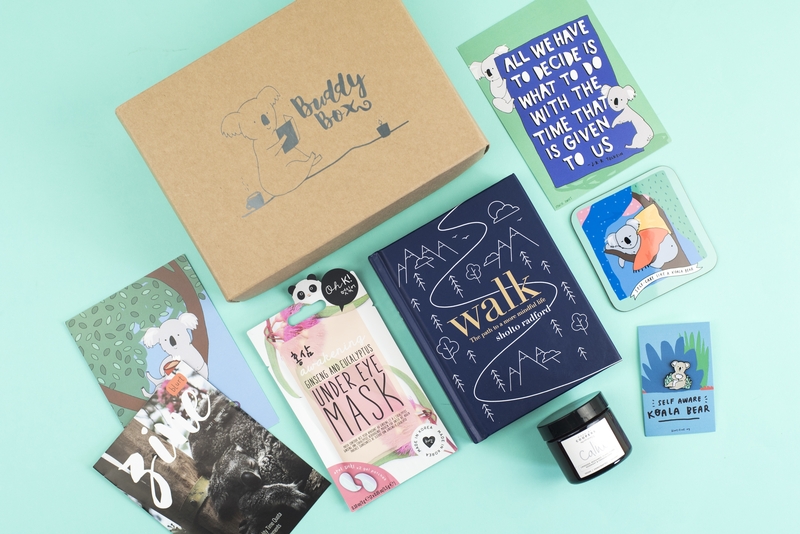 The BuddyBox is a subscription box with substance, designed to counter the pressures we face in modern life. Packed full of thoughtful, mood-lifting treats, the BuddyBox comforts, delights and gives you that warm, ‘I’ve been cared for’ feeling inside. In other words – it’s a hug in a box. "This little box is life-changing. Just when you feel alone and that no-one understands you, this lands on your doorstep and it's like a big, warm hug." Each BuddyBox contains at least 5 quality products hand-picked to nourish, inspire and encourage self-care. All the items included in the box are intended to make you feel good: helping you de-stress, find calm, feel pampered, relax, get creative, or simply have fun. You can see the products included in previous BuddyBoxes here. 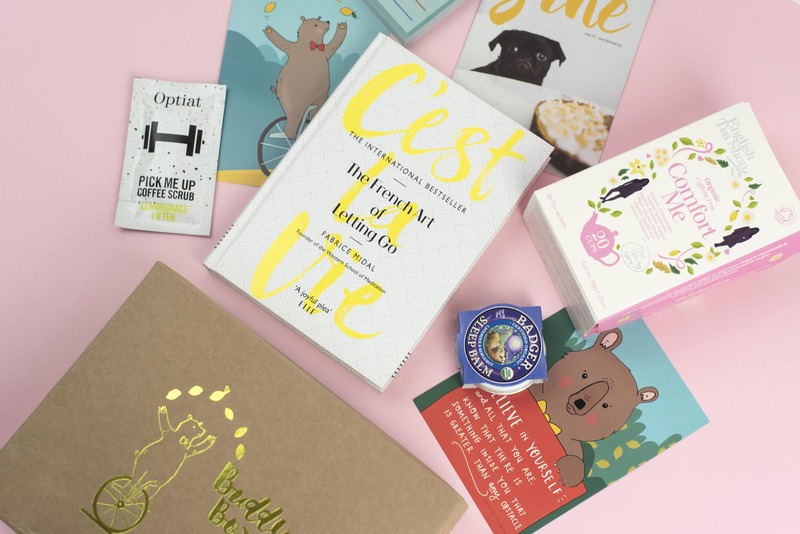 Although Blurt is an organisation that focuses on helping people with depression, the BuddyBox was created for ANYONE who could benefit from a boost, or a pick-me up, or a big dollop of self-care (see, everyone!). You can buy the BuddyBox as a gift for a loved one, or as a gift for yourself (because you deserve treating too, you know). You can even gift a box to a stranger as a random act of kindness thing (more info about that in our FAQ). And we don’t discriminate either. We aim for our boxes to be inclusive, gender neutral and ageless, so as many people as possible can benefit from the BuddyBox buzz. How often do you tell someone what you’re really feeling? How often do you say no to taking on extra work, or decline to do someone ‘just’ a small favour? If you’re anything like us, it’s not often enough. Even when we’re running on empty, and pretty close to breaking point, we don’t like to let others down, or burden them with our problems. We keep on taking on more and more, and we don’t tell anyone that we’re struggling. 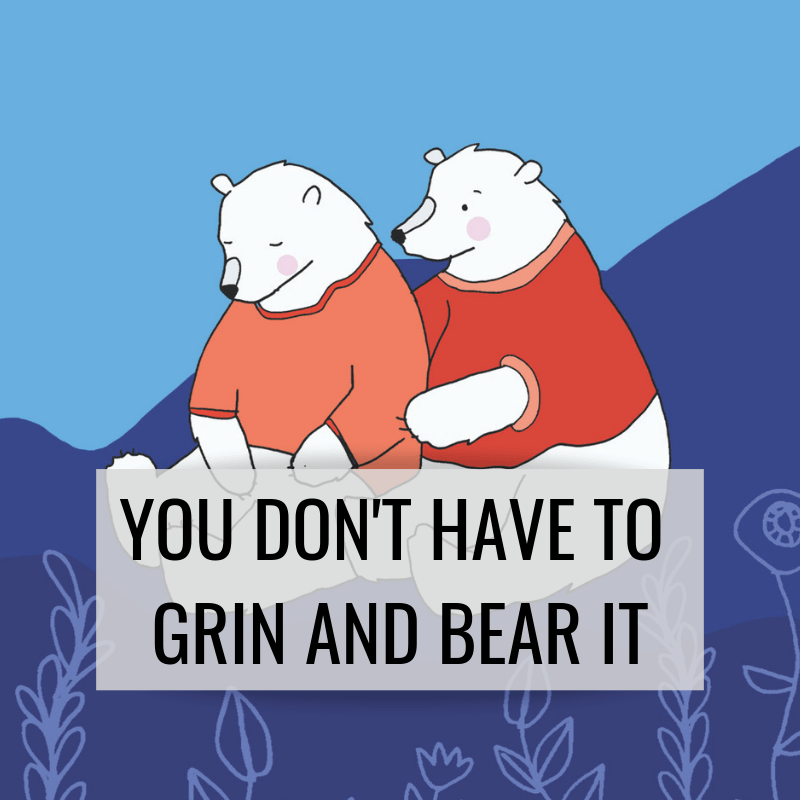 Chin up: keep calm and carry on.We really don’t have to grin and bear it though. We deserve a break. We deserve to be able to say no to things that ask too much from us, and to be able to offload. May’s BuddyBox will help by giving us the opportunity to pause, and do something just for ourself. It’ll enable us to identify wonky boundaries, and unhelpful patterns, and hopefully, make a change for the better. "It's such a wonderful gift to yourself (or someone else) and a great way to give yourself some self care." We all need more surprises in life, and BuddyBoxes spread the cheer, encouragement and love. They’re encouraging because they inspire you to take time out for self-care – which is essential for maintaining wellbeing and balance. They also introduce you to new products, past-times and experiences that may be enriching for you. And as for the love bit? Well, receiving a BuddyBox reminds you that you matter. That someone cares. That good things – lovely things – DO happen, and they can happen for you. BuddyBox profits allow us to continue our work in raising awareness and understanding of depression. We couldn’t do that without you, thank you. "The BuddyBox is the perfect way to say I care whether it be to a friend, family member or most importantly yourself." There are two kinds of BuddyBox available: the full fabulous BuddyBox, and its lovely sibling – the BuddyBox Lite. 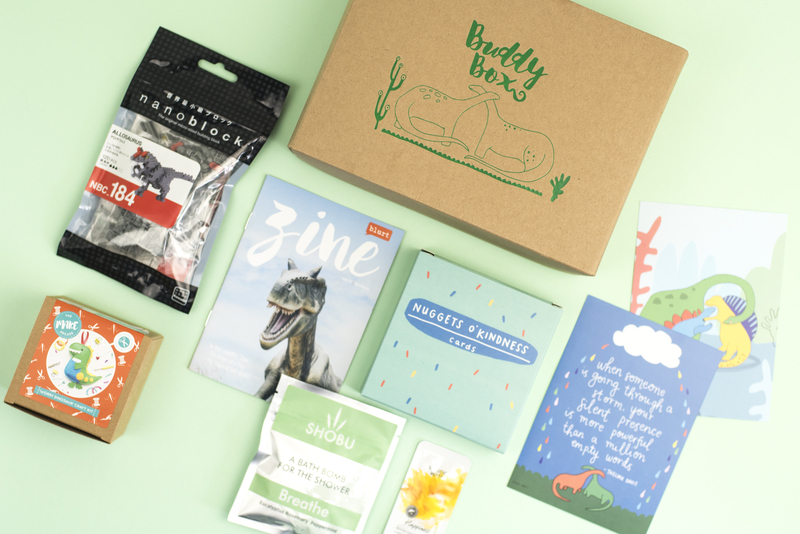 The BuddyBox (which has at least five items inside) is available as a rolling monthly subscription. You can also buy a one-off box. The BuddyBox Lite (which contains three products) is available as a rolling monthly subscription. You can also buy a one-off box. We sell BuddyBox on Demand here. If you purchase one of those, they’ll be dispatched within 2-5 business working days. You can buy a one-off BuddyBox for you, or a friend, for £21.50. There’s the option to send a personalised note with the box at checkout too. Make sure you never miss a BuddyBox with our monthly rolling subscription. You can see just a few of the many wonderful responses we’ve received below. You can read more by searching #BlurtBuddyBox on Instagram or Twitter. Ordering a BuddyBox is easy as 1, 2, 3! 1) Choose a purchase option from the options below. 2) Fill out your details at the secure checkout. if you’re buying a box for someone else, there is an option to personalise your messages. You can also gift a box anonymously if you wish. 3) Wait for your BuddyBox to wing its way to you. Make sure you never miss a BuddyBox with our rolling monthly subscription. What is in the BuddyBox? The contents of the BuddyBox vary from month to month and remain a closely guarded secret. (The surprise is very much part of the experience). When will the BuddyBox be received? If you’re out and the postman tries to deliver your BuddyBox, they should leave a ‘sorry you were out’ card. That said, there have been instances where this hasn’t happened and so it you’re concerned with the whereabouts of your BuddyBox, please do contact your local sorting office to see if they’re holding it for you. They hold parcels for a maximum of 18 calendar days. You’ll receive an email from us to let you know when your order has been fulfilled. We pack our BuddyBoxes between the 1st and 8th of the month. We are unable to change order details during that time. If you want to make a change prior to dispatch, we must be notified no later than the last day of the previous month. Can I see pictures of previous boxes please? Yes, of course, you can see pictures and reactions here. Can I order previous boxes? You can indeed! Previous boxes are available to purchase here. I’d like to send a BuddyBox to a friend anonymously, is that possible? It is. At checkout, there is a field where you can leave a personalised message. Leave that field empty, and the box will be sent anonymously as a surprise. Are BuddyBoxes suitable for men? Absolutely! There are lots of male subscribers who enjoy our boxes. Do you remember when there was an uproar when Kinder Eggs started marking the eggs with pink for a girl and blue for a boy? Well…that’s how we feel about BuddyBox. Wellbeing, self-care, creativity and timeout to relax aren’t gender specific activities. Neither are any of the products in BuddyBox. How suitable are BuddyBoxes for Vegans? We’re really sorry but we can’t guarantee that all of the products in our boxes will be suitable for Vegans. Can I donate a BuddyBox to someone in need? Since day dot, we’ve had the pleasure of dispatching BuddyBoxes which have been donated as a random act of kindness. If you’d like to sponsor a BuddyBox, you can do so here. Are BuddyBoxes suitable for children? Wellbeing applies to absolutely everyone and so we make every effort to make our boxes applicable to everyone who needs a boost. Are BuddyBoxes suitable to be sent to a psychiatric hospital? We can’t guarantee that there won’t be sharp objects included in BuddyBox and for this reason, BuddyBox would be unsuitable for dispatch to a psychiatric hospital. I only want to order a one-off box. Is this possible? It is indeed. 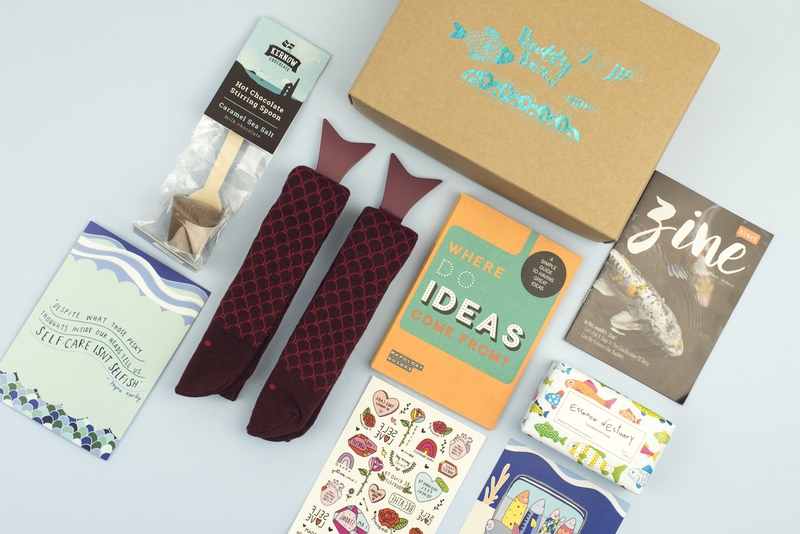 You can order a one-off, subscription free box, by clicking on the following here –> Buy a One-Off, Subscription Free Box. These run from calendar month to calendar month too. For example, orders placed in the month of June, will be dispatched on the 9th July via Royal Mail Second Class Post (or Air Mail for international orders), orders placed in the month of July, will be dispatched on the 9th August via Royal Mail Second Class Post and so on. There is no limit to the number of One-Off boxes you can order. Do I have to re-order every month? You will only have to re-order every month if you initially purchased a One-Off BuddyBox. The rolling monthly subscription will renew automatically to ensure you never miss a box. We accept payment by debit card, credit card and Paypal. When will payment be taken for BuddyBox? For one-off purchases and monthly subscriptions, payment of £21.50 will be taken when you sign-up. If you signed up for the monthly subscription, payment will then be charged again a month later. BuddyBox Lite is BuddyBox’s smaller and younger sibling. It costs £12 for a one-off box and instead of 5 full-sized products, it includes 3 products. BuddyBox Lite is dispatched the same time as BuddyBox – the 9th of each month. For example, if you place an order during the month of September, your BuddyBox Lite will be dispatched along with all of the other September orders on the 9th of October. You can purchase for yourself, or for a friend. It’s easy. Just log into your account. From there, you can choose to change your payment method and also to change your address. How do I change the delivery address details? 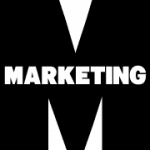 Please email [email protected] before the 1st of the month and we’ll get that sorted for you. For example, if you placed an order during December and want to change details for that order, we would need to receive the changes no later than December 31st. You can change the shipping address on your subscription via your account, but you will still need to email us to update the shipping address on your most recent renewal order. Again, we need to receive the changes by the end of the month. You can cancel the monthly subscription at any time. Just log into your account, select “VIEW” on your subscription and click “CANCEL”. I have a question which isn’t covered here, how can I contact you?